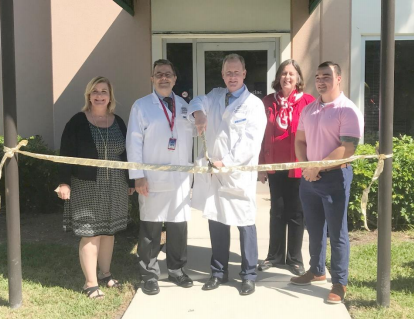 West Palm Beach, Florida – Keiser University is pleased to announce the Ribbon Cutting Ceremony for its College of Chiropractic Medicine’s Spine Care Clinic was held Saturday, March 23 at the University’s College of Chiropractic Medicine located at its West Palm Beach campus. “We are very pleased and excited to provide high quality, evidenced-based care for the South Florida community, while also offering our students the opportunity to gain hands-on learning opportunities, said Dr. Arthur Keiser, Keiser University Chancellor. Eighth-semester students at the rigorous Doctor of Chiropractic program at the West Palm Beach campus currently intern in the clinic. Patients enjoy services such as chiropractic manipulative therapy, Cox Flexion Distraction manipulation, therapeutic ultrasound, and electric stimulation physiotherapies, therapeutic and postural exercises, foot orthotics, and more. "The opening of our clinic represents the transition from academia to clinical practice for our students. I am proud of these students who are pioneering and helping shape the clinical experience," said Ralph Kruse, the Chiropractic Physician, and Attending Clinician. The rigorous Keiser University Doctor of Chiropractic program prepares graduates to make a difference by relieving patients’ pain, improving their mobility, and guiding them to lead healthier lives. The program combines traditional lectures with small-group learning, weekly conferences and seminars, laboratory and experiential sessions, and clinical training opportunities — all with an emphasis on case-based relevancy for chiropractic practice, a profession dedicated to excellence in spine care. The facility is open to the public Monday and Wednesday from 9:00 am – 6:00 pm and Friday from 9:00 am – 5:00 pm. To learn more please visit www.kuspinecare.com or call 561-273-0099. About Keiser University Keiser University is a private, not-for-profit university, serving nearly 20,000 students and employing 3,800 faculty and staff members. Co-founded in 1977 by Chancellor Arthur Keiser, Ph.D., and Evelyn Keiser, the university currently offers more than 100 degrees at 21 Florida campuses, as well as online and at two international sites. Keiser University is accredited by the Southern Association of Colleges and Schools Commission on Colleges as a level VI institution to award certificates and degrees at the associate, baccalaureate, masters, specialist, and doctoral levels. For additional information regarding Keiser University, visit www.keiseruniversity.edu.